ATAGO releases the world’s first non-destructive IR Brix meter that requires no juicing or cutting up of fruits. 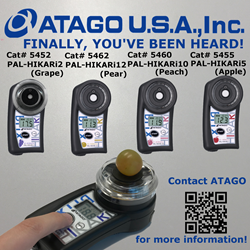 ATAGO is glad to announce the launch of a new product, PAL-HIKARi series, a portable non-destructive IR Brix meter that will revitalize how the Brix is being measured. “You ask, we create.” PAL-HIKARi’s design is a ubiquitous forme of our customer’s voice across 157 countries. With 76 years of experience, ATAGO brings together the industrial trust in arguably the world’s best refractometers. PAL-HIKARi is simple to use. Just place the sensor against a fruit on the tree and press a button. The button located on the lateral side of the PAL-HIKARi, the curvature of the main body provides an ultimate ergonomic and functional design. Ergonomics was an integral part of designing, manufacturing and use of PAL-HIKARi. The small size that fits in the palm of a hand, PAL-HIKARi consists of 20 LEDs with 6 custom wavelengths, lined up in a circle to accurately detect sugar. A cushion on the measurement section makes a snug fit to even irregularly shaped fruits. No more burden of cutting the fruits then squeezing and filtering the juice. No sample liquid, which means no more cleaning of the prism sensor. With increased work efficiency without wasting the precious fruits, PAL-HIKARi is simply a one of a kind technology that will provide satisfaction to everyone’s daily operation. For more information about the PAL-HIKARi series, please visit our website: http://www.atago-usa.com or call us at 425-637-2107.